This article is a part of working with bug reports. Important note: please read Using EurekaLog in multi-threaded applications article before reading this article. Call stacks in multi-threaded applications contain additional information. It contains 2 call stacks: one per each thread. 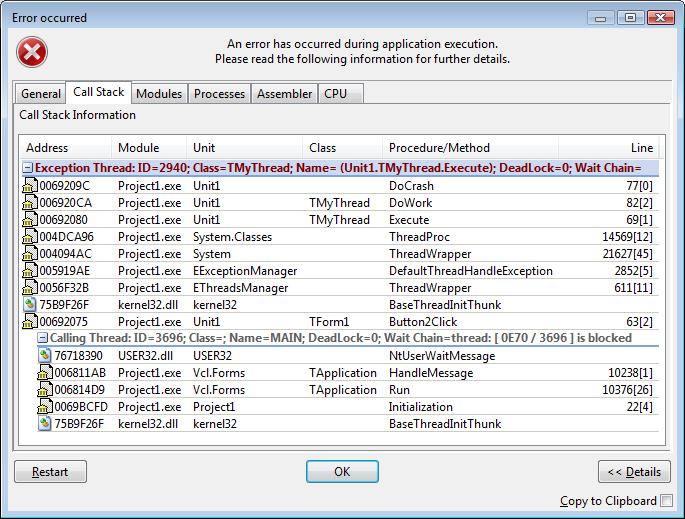 There are two threads in this application: main thread and a background thread based on TThread class. There was exception raised in the background thread. Bug report contains a single call stack by default. This call stack is created for thread which raised the exception. Such thread is called "Exception thread". This is the only thread in single-threaded application (it will be main thread for single-threaded application). Sometimes you may be interested in other threads, you may want to know what other threads are doing when exception had occurred. You can capture call stacks of other threads in application by checking "Capture stack of RTL threads" or "Capture stack of Windows threads" options. • capturing call stack of an external thread requires thread's suspending. In rare case this can cause deadlock issues (for example: thread may be suspended when it is running memory allocation function; thus, any further memory alloc/release operation will block application forever). Do not enable this option until really needed. • Calling thread. This is parent thread for exception thread. Normally, there is only one calling thread in bug report. There may be more than one calling thread if exception occurred inside synchronized routine (see below). This thread follows exception thread in the list. It's optional. It will be not shown if this thread was terminated before exception or if the corresponding "Capture stack of XYZ threads" option is turned off. • Running thread. Any other thread is called "running thread". Main thread can also be a running thread. All running threads are listed after exception thread and calling thread(s) (if any). Note: the meaning of exception and calling threads are changed significantly for exceptions within synchronized methods (see below). o BeginThread or BeginThreadEx function. • Windows threads. Any other threads are considered as "Windows threads". Such threads are created via CreateThread function. It's recommended to create your own threads via TThreadEx class or via BeginThreadEx function (or via any other function which use TThread or BeginThread to create threads). Do not use CreateThread function to create threads. This will allow you to distinguish between your threads and system threads (system or 3rd party code may create additional threads in your application for background/service tasks). • If you're using TThread(Ex) approach - then EurekaLog will be able to extract (child) class name and show it in the call stack's header as "Class=TMyThread". • If you're using BeginThread(Ex) or CreateThread approach - then EurekaLog will be able to extract thread function and show it in the call stack's header as "Name= (ThreadProc)". Thread function's name will be printed in parentheses (see "Naming threads" below to know more about "Name" parameter). Thread function's name will always be Execute method for TThread approach. You can name threads to simplify debugging. Since you can run multiple threads with the same thread class (or thread function) - this means that you can not distinguish between these threads by using only class name (or thread function's name). You need some additional marker. Such marker is a thread name. Note: main thread will always have a name "MAIN". Since you can run multiple threads with the same thread class (or thread function) and with the same arguments from multiple locations - this means that you can not distinguish between these threads by using class name (or thread function's name) and any properties of the thread itself. You need to use name of thread's creator. • do not confuse last line in thread's call stack ("creator") as belonging to the thread itself. This code was executed by different thread (indicated by "Parent"). This line was not executed by the thread itself. • Priority value indicate thread's priority as returned by GetThreadPriority function. EurekaLog has support for WCT (Wait Chain Traversal) feature available since Windows Vista. WCT is a mechanism for debugging blocked threads and processes, and detecting deadlocks. 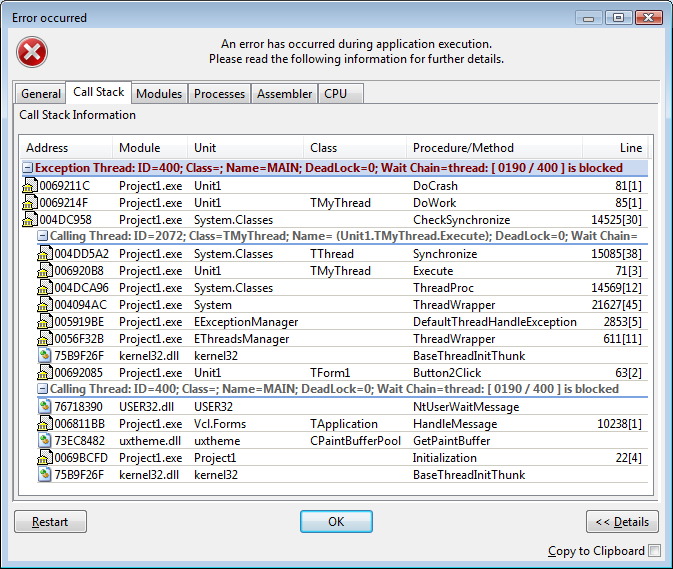 Using WCT, debugging software can analyze executing processes and report on the state of threads, including information such as what a blocked thread is waiting for and whether a deadlock condition exists. Debugging software can analyze and then reports the state of threads. A thread's state (unblocked, blocked, or deadlocked) is reported as a wait chain. A wait chain is an alternating directed graph of threads and synchronization objects. In the graph, an edge from a thread to an object indicates that the thread is waiting for the object; an edge from an object to a thread indicates that the thread is the current owner of the object. For example, the following wait chain represents a thread (Thread A) that is blocked waiting for a mutex object that is owned by Thread B. Note that Thread A appears twice. The second node for Thread A could be replaced by an edge (->) that connects Object 1 to the first Thread A node, creating a loop that represents the cyclic dependency. • EurekaLog shows thread's wait chain in "Wait chain" value. Simplest wait chains (that is wait chain which consists of a single node) are not shown ("Wait chain" value will be empty). WCT feature is accessible only on Windows Vista and above. "Deadlock" and "Wait chain" values will be empty on older OS versions. EurekaLog lists TID ("ID") and PTID ("Parent") values to help you identify child/parent threads. Additionally, a parent thread for exception thread is marked as "Calling thread" and is shown below exception thread for your convenience. It will be not shown if this thread was terminated before exception or if the corresponding "Capture stack of XYZ threads" option is turned off. • main thread waits for window message (i.e. it is processing messages; it's inside message loop). This is indicated by last call stack for main thread (ID = 400). • First call stack for main thread ("exception thread") does not represent any real-time information. Main thread is doing message pumping at the current moment - as indicated by the second call stack for main thread. Exception thread shows some older state of main thread - that is the state when main thread was doing tasks for Synchronize. In other words, there are two call stacks for the single thread (main thread): one represents the past and second represents the current moment. • "Exception thread" is not a real exception thread. The handled exception was (re-)raised by TThread.Synchronize wrapper which was called from the background thread. This means that exception thread is the background thread, not the main thread (as call stack suggests). However, main thread is still considered as exception thread. • Call stacks for manual synchronization (such as SendMessage into main thread) will not be merged. • This feature supports merging call stacks for any exceptions that was re-raised into another thread. Synchronize calls is just a sub-case of generic cross-thread exceptions. • This feature supports any TThread-descendant - such as AsyncCalls or OmniThreadLibrary.